Joe Moore Callahan (second from right) presents Loyola's donation to Emuwa. Also pictured is Moore (far left), Summur Roberts, Loyola Director of Community Relations (center) and Phil Hale, Loyola Vice President of Government Affairs. 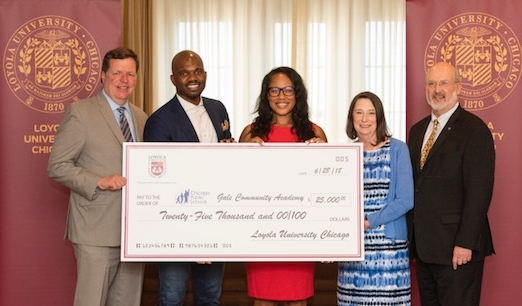 Construction of a health and wellness clinic at Gale Community Academy, an elementary school located at 1631 W. Jonquil Terrace in Rogers Park, has been made a reality due to a recent $25,000 donation from Loyola. SMART Health Clinics (Strategies that integrate health and education to Maximize and improve Academic Success Reaching all students to ultimately impact the Trajectory of lives) are installed in schools which have a majority of low-income students who don’t typically have access to health care. These clinics are staffed with social workers, psychologists, physicians and nurse practitioners who offer primary and mental health care. The SMART Model supports the connection between high-quality health care and academic success. Construction on the clinic at Gale Community Academy is expected to begin this summer, and the school is hoping to gather the funds needed to conclude construction in September — before the start of the school year. 49th Ward Alderman Joe Moore requested this one-time grant from the university by contacting Loyola’s administration. $25,000 was needed to begin the project, according to his announcement. Margaret Callahan, Loyola Health Sciences Division Provost, presented the check to Augustine Emuwa, the principle of Gale Community Academy, at Loyola Water Tower Campus June 28. “We know that healthy communities start with families, and especially with children, whose educational outcomes are significantly affected by healthy behaviors,” Callahan said in an email to The Phoenix. A SMART Health Clinic replaced a failing health center at Sullivan High School — also located in Rogers Park at 6631 N Bosworth Ave — in 2013. The CVS Health website said as a result of the SMART Clinic being built at Sullivan High School, healthcare has become more widespread within the student population and attendance and behavior have both improved. Moore’s announcement said Loyola’s donation “seals the deal” for the start of construction at Gale Community Academy this year. The clinic will also provide Loyola students with experiential opportunities in their fields of study. “The SMART Clinic will have a significant impact on families in the Rogers Park community, and also provides Loyola students with expanded opportunities for student teaching and clinical nursing experience,” Callahan said. The school must raise a total of $150,000 in funds to make the clinic fully operational, according to Moore’s announcement. 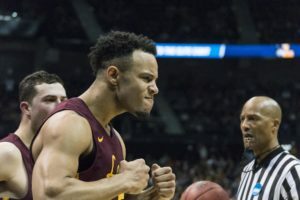 The Rogers Park community has helped to raise more than $100,000 dollars for the clinic, including Loyola’s donation. The school has held social events as fundraisers and has encouraged people to donate on youcaring.com or with cash. Heather Steans, an Illinois state senator, and her husband Leo Smith began the fundraiser by donating $40,000. Moore is encouraging community members to donate on youcaring.com so the project can be completed by September.